Mysteries embedded in the iconic departmental store GUM have been unveiled in a new book by art and architecture critic Grigory Revzin. With his co-authors, Revzin has showcased crucial aspects of life and times of the Soviet era through this encyclopaedic slice of Russian life, seen through the windows of the famed shopping arcade on Red Square. We take a look at different perspectives of the department store, and the glimpses of 20th century Russian history to which the building has borne witness. In its near century-old existence on Moscow’s Red Square, the iconic GUM has been mute witness to almost all of Russia’s recent history. The lifestyle department store seen it all, from brisk trade and fashion shows to hard times and from funerals and upheavals to victory parades. The shopping arcade has, over time, also been lived in as a residence, and has survived several threats of demolition. GUM was a mirror that reflected the life of the country; both the real and the longed-for. The store’s history has now been documented in a two-volume Encyclopaedia of GUM, recently published in Moscow. Art and architecture critic Grigory Revzin and his co-authors have compiled an encyclopaedic slice of Russian life, seen from the windows of the country's flagship store. 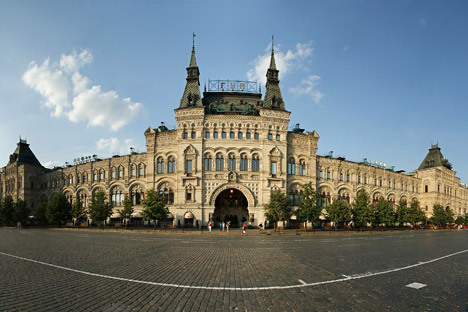 We have chosen four aspects of the store’s history from the encyclopaedia, each showcasing different perspectives both of the department store, and key events of 20th century Russian history that are associated with it.